The underlying structure of the DETEXI NVR software consists of many individual services, which allow execute and organize all the tasks it is responsible for. The services are registered with Windows as Services; some are configured as automatic by default. All services are visible and configurable in the NVR Control Center — Monitor. Knowing the responsibility of each service is important. This allows users to make sure the necessary services for the given application are running and controlled properly, while unnecessary services are turned off to preserve system resources. Monitor — Also known as the Startbar, is an internal service to start/stop other NVR services. The Monitor service is also responsible for monitoring the health and status of all NVR Services. Server — Also known as the CamServer, authenticates remote users connected to the NVR through the Remote Client. The CamServer is also responsible for tracking statistics about the remote user’s connections. Recorder — Records information and images from each video input into the NVR archive, according to the configured schedules, preferences, alarms and events. FTP Server — Receives images from cameras via FTP (if configured) and writes them into the NVR archive. It also raises an alarm when such images are received from a camera, and can also be used for FTP notification of IP address changes from the camera to the NVR. Check Drive — Monitors the condition of the storage path and device to confirm existence and available space for new video being recorded to the archive. Check Alive — Monitors if camera is online and video inputs are active. Check Alarm — Monitors the hard inputs of connected video devices, and raises alarms when defined changes are seen on such inputs. Tour — Moves PTZ cameras through a predefined series of locations according to defined schedules or on alarms or events. Get Shots — Captures still shots related to alarms from streaming video when configured, and stores them in a special location in the archive. Port Mapper — Also known as the Port Mapper. When configured, the Port Mapper routes network requests between two network connections on different subnets or networks. This allows for separate security and corporate networks across which the DETEXI system can communicate. Port Listener — Also known as the I/O Listener, has the ability to monitor alarms raised by local alarm devices connected to the NVR computer via COM ports. Alarm Server — Also known as Alarm Central, is responsible for raising alarms via the Text-to-Speech engine, telephone, e-mail and other mediums. This is configured as an Automatic Windows Service and starts at Windows startup. Remote Server — An internal service for intercommunications between linked NVR Domain Controller and child NVRs. This is configured as an automatic Windows Service and will start with Windows. Socket Server — An internal service to support remote TCP/IP access to the NVR. This is configured as an automatic Windows Service and starts at Windows startup. All services are visible and configurable in the NVR Control Center — Monitor. The status of all the cameras that have been installed can be seen there as well. The color of the service name indicates its status — blue while running , red while stopped. The checkbox next to a service name configures how it is affected by the Monitor service. If a service is checked, its status will be monitored and displayed. Checked services will also be started/stopped along with the Monitor service. The Monitor service is started and stopped using the Start/Stop NVR Service toggle button in the NVR Control Center — General — Global Settings. For most settings, the NVR Services support Runtime Configurations. This means that changes can be made to cameras, users, etc. without stopping the NVR Services. When you are ready for your changes to take effect, you should synchronize the services with the current configuration. The Synchronize button is found in the upper right-hand corner of the NVR Control Center, no matter what page is active. Knowing the responsibility of each service users can run just the necessary for the given application services, while unnecessary services can be turned off to preserve system resources. It is recommended that the Monitor service be active at all times. "Checked" services (with checked checkbox next to a service name) will be monitored and started/stopped along with the Monitor service. 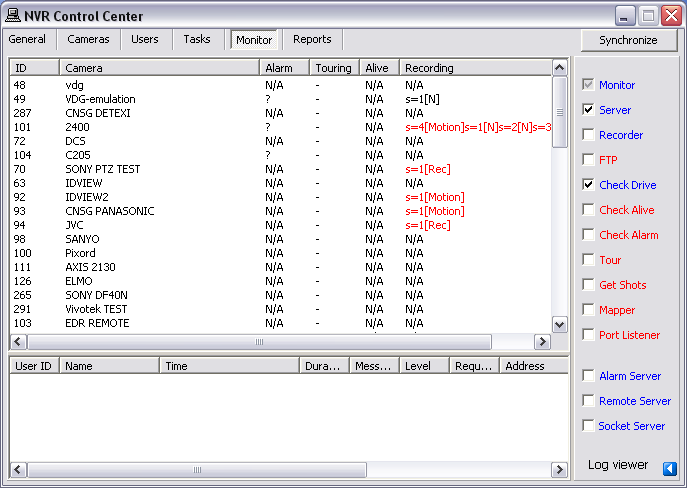 In the NVR Control Center — Monitor uncheck all services except Server and Recording to enable monitoring. Click on the service names to turn the Server and Recording names blue and all others — red . This turns off the unnecessary services while keeps running the authentication and recording services. Click Synchronize button to activate the new configurations. During the system tuning you may need to disable restarting a service by the Monitor service. Uncheck the service checkbox to disable monitoring. Than you can click on any service name to turn it red to stop the service or blue — to run.